Replace your flimsy locks with real protection. 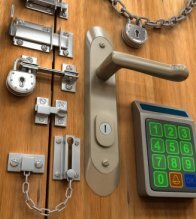 True door security systems include the door itself, the frame surrounding it, a deadbolt lock, door security hardware, doorbell intercom, peephole, outdoor security lighting and burglar alarm equipment. Most residential doors are weak in all these aspects and keep out only the weakest predators. Most home's doors will burst open with just a kick or two – or quietly yield to prying, lock bumping or picking in less than 10 seconds. Side and back doors often are even weaker – and have fewer possible witnesses to call the police (whose national average response time is NINE minutes). • Door: standard steel-clad (24-gauge) or 1 3/4-inch thick hardwood (with NO recessed panels). • Doorframe: secure it to the wall-studs by drilling 6-inch hardened-steel screws through the doorframe and into the wall-studs. • Deadbolt Lock: far and away the best is the Schlage B760 or B860. Only they prevent ALL lock bumping and picking – AND all forms of ramming, kicking, bashing, prying. • Door Security Hardware: the best are the Mag-747 strike-plate and the Don-Jo wraparound. Also, use 4-inch hardened-steel screws on hinges. See Security Products - Door. That’ll give you a rock-solid door for less than US $200. You must fortify all your exterior doors – see why at Home Security - Break-In. Standard doors are either 1-3/8 or 1-3/4 inches thick, and most hardware adjusts for either. Extension kits are available for thicker doors. The backset (the distance from the center of the lock to the edge of the door is usually 2-3/8 or 2-3/4 inches) must match the hole in the door. Some hardware sets adjust for both backset lengths. Locks are either left- or right-handed models. To find yours, look at the door’s hinges from outside the door. Hinges on the left = a left-handed lock. Hinges on the right = a right-handed lock. Most deadbolt locks install quickly with only a screwdriver. If you want to use one key on multiple locks (from the same manufacturer), have a locksmith "re-key" the locks to the same key (before installation). • Doorbell Intercom: to know who’s at your door before you open it. • Peepholes: again, to know who’s at your door before you open it. • Outdoor Security Lighting: nighttime burglars prefer the dark. • Burglar Alarm Equipment: either DIY Home Security Systems or a monitored house alarm. Burglary Prevention relies on your entire family’s careful behavior. See Home Security - Overview. Gamble in Vegas – not in your life. NO security products are guaranteed to prevent any crime - but will likely serve you well if combined with the guidance in Home Security Overview and Outdoor Safety Overview. Michael Edward Loftus Sr wrote this website with data from the FBI, DOJ, CDC, and the books listed here as well as from interviews with cops, crime victims, and my own personal experiences as described in my Bio. This material may NOT be copied, published, broadcast, rewritten, or redistributed.